For more information about our forays, visit the UPCOMING FORAYS page. Physcomitrium pyriforme is an annual or short-lived perennial moss of open bare ground that is widely distributed across most of the world. 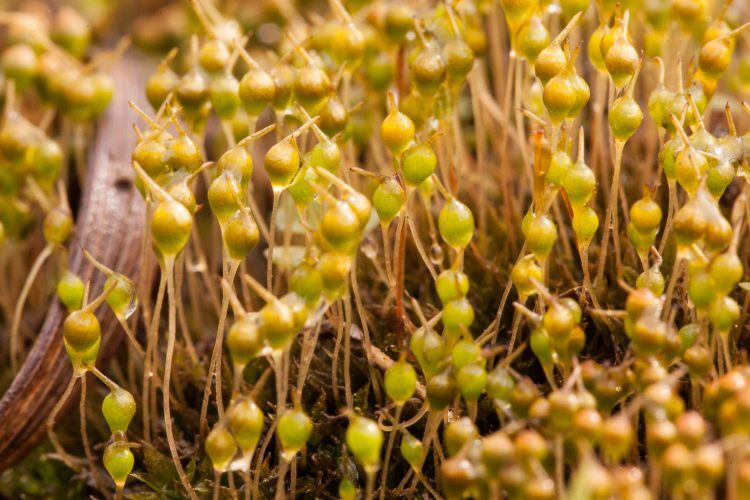 Bladder moss, Physcomitrium pyriforme, on a rainy day in early April 2012. We would like you to consider sending us your upcoming collections of Physcomitrium to be part of a new research project, a collaboration among the University of Connecticut, Texas Tech University, and Augustana College. We are using this moss as a model system to study plant evolutionary mechanisms and we would appreciate samples from Ohio (or elsewhere in the Midwest). Since their purpose will be culturing, we need recent collections with viable spores (mature but still operculated capsules preferred). Physcomitrium mosses are typically spring ephemerals found in disturbed soils, croplands and lawns. Bernard Goffinet, Ecology and Evolutionary Biology, University of Connecticut 75 North Eagleville Rd, Storrs, CT.
Dr. Medina was the guest on a recent episode of the botany podcast “In Defense of Plants,” during which he described the project. You can listen by clicking the thumbnail image below to visit the podcast episode site. Dr. Medina and his colleagues have put together very clear instructions for locating and collecting the moss samples, shown below. Note that they are endeavoring to grow their study plants from spores, so timing is crucial to get ripe capsules. Let’s keep an eye out for Physcomitrium patches in the weeks ahead and monitor the plants with the goal of collecting them at just the right time. Please contact me via the webmaster email link in the header above when you have located specimens or have questions about how to do so. Unless you prefer to send samples yourself, I’ll be happy to collect them from you and send all the specimens together to the University of Connecticut lab. Thanks, and happy moss hunting! The guide is free, and can be obtained (along with all the other ODW identification guides) at the ODW District 1 (Central Ohio) office at 1500 Dublin Road Columbus, Ohio 43215, or by calling 1-800-WILDLIFE. Additional contact info for ODW including an e-mail address that will probably also work for requests, can be accessed HERE (link). 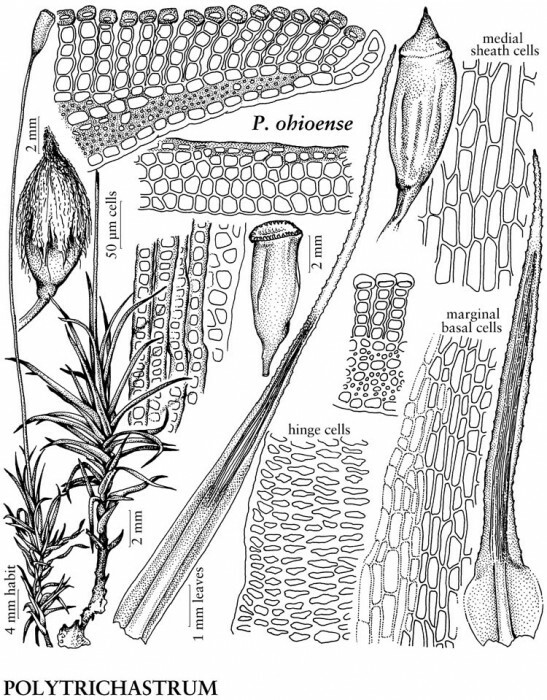 The Flora of North America Editorial Committee offered bryologists the opportunity to help defray publication costs by sponsoring illustrations for volume 27 or volume 28 of FNA. These are the two moss volumes, of which 27 was completed in 2007, 28 will appeared about mid 2014. Individuals and organizations sponsored one or more drawings, at a modest financial cost. Sponsors have their names acknowledged in the introductory chapter of Volume 28. OMLA has chosen to sponsor Ohio haircap moss, Polytrichastrum ohioense, the only illustrated taxon with “Ohio” in its name. We’re pleased to be able to help with such a worthy endeavor, and aqre enjoying seeing and using the new volume. 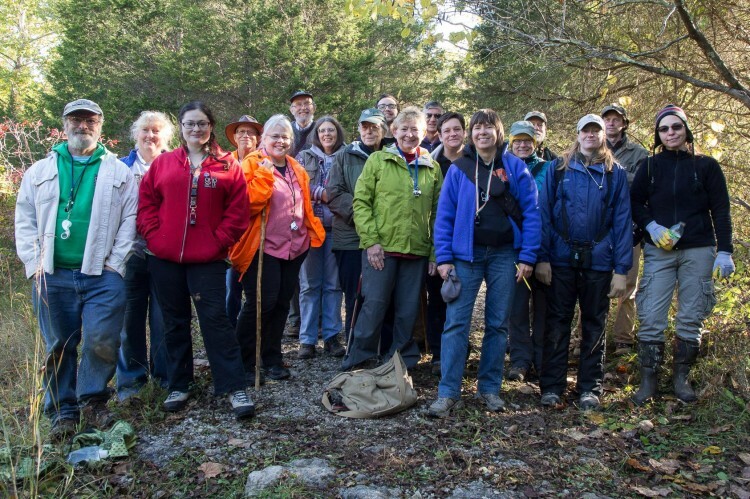 OMLA was born from an organizational meeting of a number of naturalists and professional educators held in June, 2004 at the Gorman Nature Center. 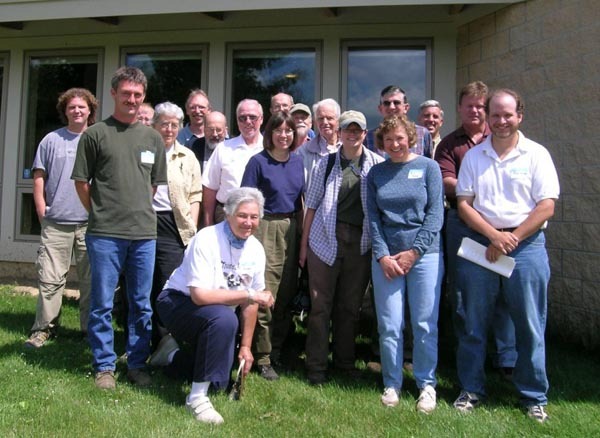 Founders meeting of OMLA at Gorman Nature Center in June, 2004. 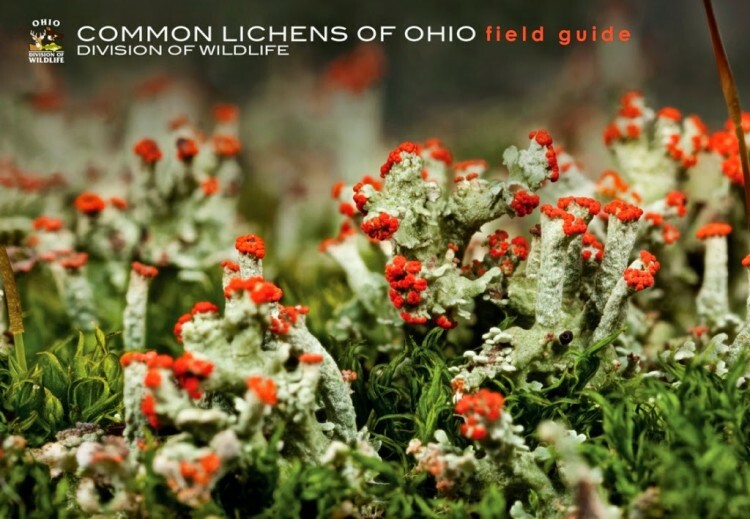 Goals of the association include encouraging amateur and academic students in study of these organisms, expanding the knowledge of lichen and bryophyte distributions in Ohio, and gaining a better understanding of rare lichens and bryophytes in Ohio. OMLA pursues these goals through workshops and field trips (forays). The first Fall Foray was a two-day field trip to the Edge of Appalachia preserve system in Adams County (October, 2004). This was such a success that one member asked “So what are we doing next weekend?” It was decided to have a two-day foray every fall. OMLA also does one-day forays. 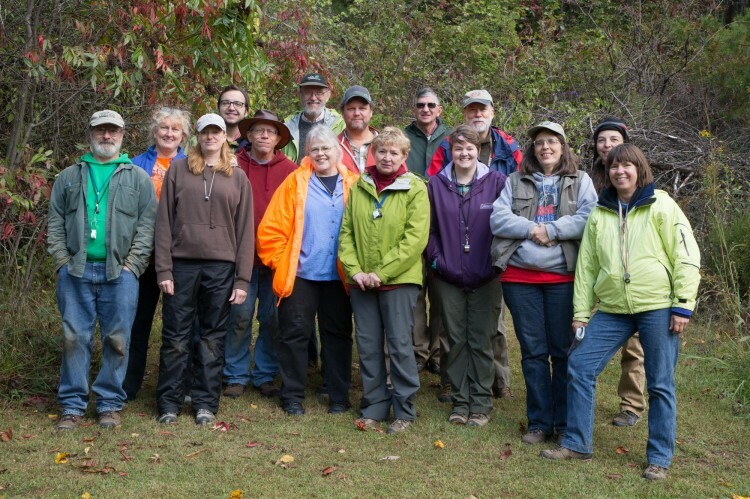 The First OMLA Foray: Edge of Appalachia in October, 2004. Ten years later at The Edge of Appalachia. October, 2014. Ten years later at Strait Creek Preserve, Pike County, Ohio. October, 2014.